When planning US trip, I discovered there are three options most people use when leaving NYC to visit Niagara Falls and Toronto; either they take a train to Buffalo, pay to a tour company or fly. Trying to avoid any more flights and wishing to spend more than just an afternoon in Toronto, I was searching for option number four. Something that would not require renting a car. After days of research and contacting some locals, I found the solution. Keep reading to discover how you can pay less and get more. Note you’ll need to book your trip months in advance, if you want to save. From New York, NY you take megabus to Toronto for 15 USD. You’ll spend 12 hours on the bus, which is a little tiring, so wear something comfy, take a book or your favorite magazine, and try not to forget a pillow. The bus we took was at 7.50am, but if we did it again, we’d change it for the one at 11.50pm instead. It’s a long ride and if you’re driving at night, you’ll most likely manage to catch some sleep. Not as much as you wish and sure, you won’t wake up feeling fresh, but at least you won’t throw the whole day away because of one bus ride. Tickets can be booked here. Pricing for tickets increases according to how many people have booked tickets, therefore I advise you to be quick and book yours around 2 months in advance. I know greyhound does the same route, but I am not sure about their starting price or anything else, because I’ve never used their service before. Find more information on their website. From Toronto you take megabus or greyhound to Niagara Falls. For this one megabus has a starting price 15 CAD (at least so it seems) and you can book it last minute. 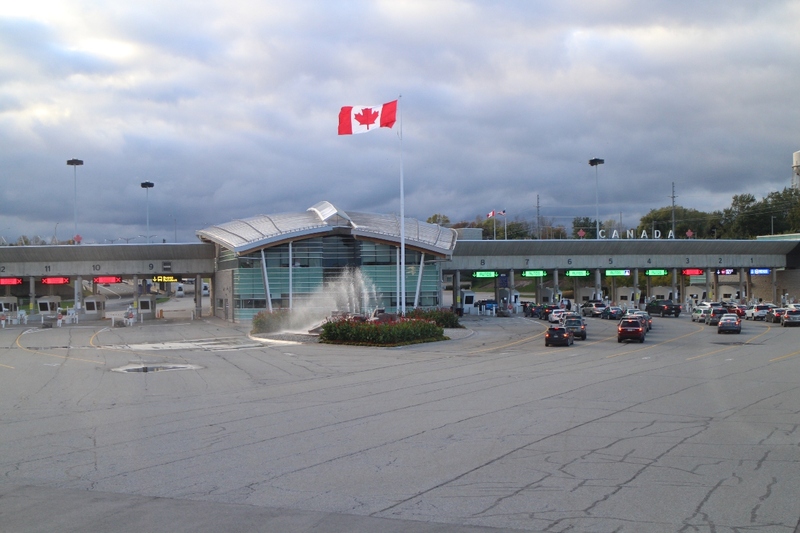 Once you’re in Niagara and done with sightseeing, you can head towards Buffalo, but to get there, you first need to cross the border. The current fee for pedestrians to cross the Rainbow Bridge is s $.50 (have your change ready; they take US and Canadian dollars). On American side, you can spend some more time wandering around or go directly to the Visitor Centre (5 minute walk), where your bus is going to stop. If not sure, you can ask inside, where the stop is. You’ll be waiting for bus #40, heading towards downtown Buffalo. Tickets cost 2 USD (have change, again). The timetable can be found here. The ride is over one hour long, but the final stop is also the starting stop for your next bus, which makes the whole thing easier. When heading back to NYC, we took a night bus. It departs at 10pm and if you’re travelling as a couple, you may want to book your seats online. The bus was absolutely packed when we went, and I imagine that’s the regular case, because we were there off-season. The next morning you’ll wake up in NYC. This definitely isn’t the most comfortable way to travel, back and neck pain may come as a side effect, but it’s cheap (under 50 USD per person) and it gives you a possibility to see Toronto calmly, without feeling the pressure to rush. Exactly what I was searchinf for.